The world of Avatar is remarkable not only for its entertainment value, but for its remarkable maturity. Avatar: The Last Airbender deals with themes of death, destiny, and classism, all of which have been brought forward into and magnified in The Legend of Korra. These thematic ideas tie into structural similarities to anime and separate this franchise from its Western counterparts. J and I discuss these concepts and more in our second episode of Ember Island Airwaves. We also talk about the addition of Kai to the cast, the return of Zuko, and how the loss of a certain non-bender affects ensemble dynamics. We conclude with a spirited but brief discussion of the much-abhorred M. Night Shyamalan flick, The Last Airbender. Enjoy the show online, or download it here! As mentioned in the podcast, here is the misleading M. Night Shyamalan interview conducted by series creators Mike DiMartino and Bryan Konietzko. 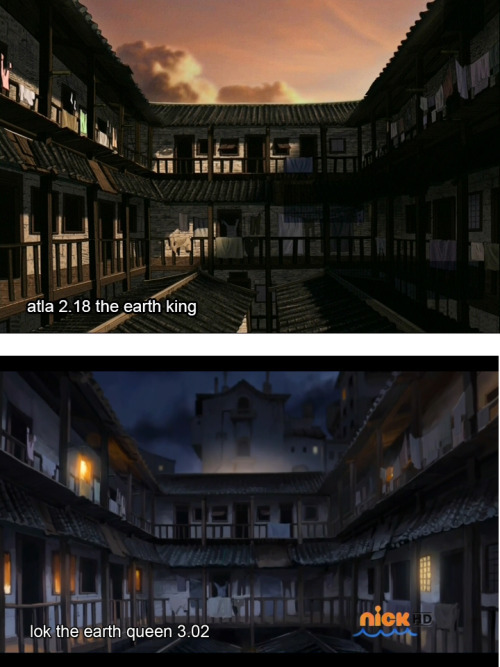 We also brought up the fact that Mako and Bolin visit the same apartment complex in “The Earth Queen” as Zuko and Iroh in “The Earth King,” as evidenced in this screenshot comparison. What do you think distinguishes Avatar and Korra from other Western animated series? Where do you think Zuko’s dragon comes from? Let us know in the comments below! In case you forgot what the groundbreaking fight scenes in The Last Airbender look like, this should refresh your memory. This podcast uses clips from the songs Nanyang Journey and Erhu by Ivan Chew / CC BY 3.0.